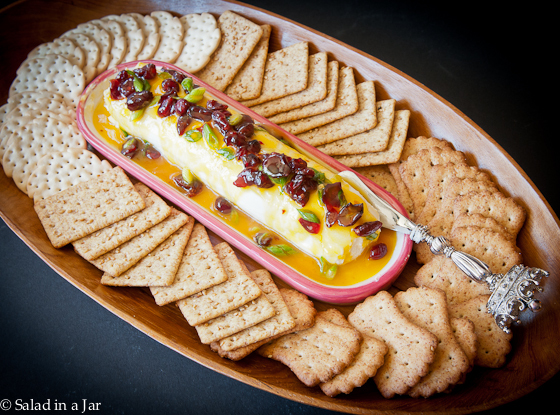 Spicy Mango and Cranberry Cream Cheese Appetizer is a cream cheese log with Gorgonzola, topped with Mango Green Apple Habanero Sauce. It’s definitely got the sweet and spicy thing going on in spades. Have you ever inherited a friend? I’m talking about a friend you have because they were already friends with somebody you love. My friend Tamara was my husband’s friend long before I ever met him. Not in a romantic way. Just friends. They grew up at the same church. Lucky for me, I inherited our friendship. The amount of blackmail material I’ve squeezed out of her should last for several years. God uses Tamara to teach me a few things about hospitality, and being joyful when life isn’t. She’s a good cook, too. 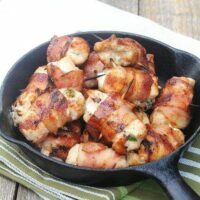 This oft-requested recipe is just one example. You’ve probably already seen various toppings poured over a block of cream cheese, but this cheese has Gorgonzola added which contributes a certain something special you will be hard-pressed to identify. But the best part is the sauce–Mango Green Apple Habanero Sauce by Cookwell. Unfortunately, it can be difficult to find, but it’s available online, so I decided to go ahead and share it. In Texas, it is available at some H-E-B stores (found mine in Burleson). I am guessing jalapeno pepper jelly would be a good substitute if you can’t find the mango sauce. This goes together quickly. Seems like a great idea for a Super Bowl party! P.S. I was not compensated in any way by Cookwell for saying nice things about their product. 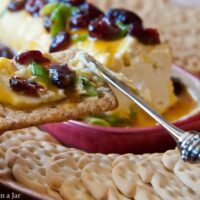 Spicy Mango and Cranberry Cream Cheese Appetizer is made up of cream cheese mixed with Gorgonzola, topped with Mango Green Apple Habanero Sauce. Combine 1 tablespoon Mango sauce and Gorgonzola with cream cheese using a food processor, mixer, or the back of a spoon and elbow grease. Spoon onto a sheet of plastic wrap and mold into desired shape such as a roll or brick. Chill. Blend the remaining bottle of the sauce with the onions and cranberries. Mix well. 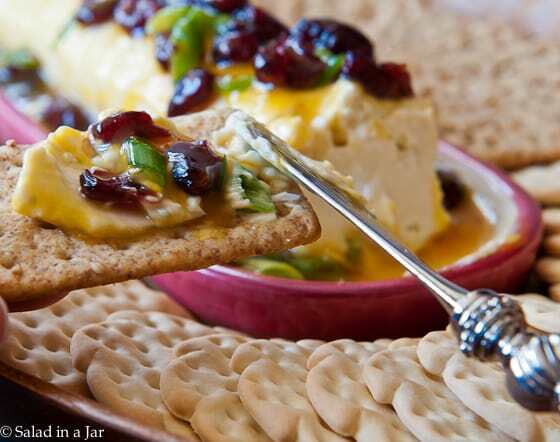 When ready to serve, place cheese on serving plate and cover with sauce, onion, and cranberries. 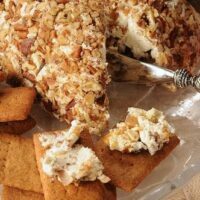 This cheese ball is on the sweet side with cream cheese, cottage cheese and dates. Previous Post: « What Is the Best Vacuum-Pack Machine for Saving Lettuce? Easy and beautiful! Love it! I think Central Market is related to HEB, so that’s where I’ll look for the special sauce. Easy and beautiful! Love it! I think that Market Street is related to HEB, so that’s where I will look for the special sauce. The mango with the cranberries sounds wonderful. What a great dip! Mango and habaneros sound like a fantastic combination. I’ll keep my eye open for the sauce. If I can’t find it I’m thinking of mixing up my own. This appetizers looks really tasty, and the addition of the Gorgonzola cheese sounds great. A good snack for the up coming game. As usual your photos really stand out 🙂 Have a great week Paula. Paula, that has to be one of the prettiest appetizers I’ve ever seen! And I am quite intrigued by the Gogonzola/cream cheese base, yum! Thanks! I live in Texas but I don’t know what does H E B store is…Well I am new to Texas….It does look yummy…. It sure does present nicely! Colorful and appetizing and perfect for a group gathered in the family room around the coffee table. 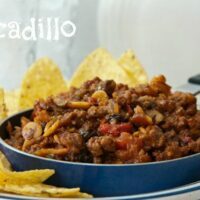 Cranberries seem to make everything special and this sounds so good!